Aflatoxin contamination in traditionally fermented cereal-based beverages is a serious food safety challenge considering that commercialization of these products is rising. The challenge is aggravated by the fact that aflatoxin elimination from the food chain is almost impossible. This paper focuses on Obushera, a popular traditional spontaneously fermented sorghum – millet beverage from Uganda. Mold and total aflatoxin levels in cereal flours and Obushera from different markets in Kampala were determined. Ability of lactic acid bacteria (LAB) starters from Obushera; Lb. plantarum MNC 21, W. confusa MNC 20 and L. lactis MNC 24 to bind aflatoxin B1 (AFB1) was evaluated against Lb. rhamnosus yoba 2012 as the reference strain. Mold counts in sorghum, millet and Obushera ranged between 0.0–2.4 log cfu/g, 2.0–6.5 log cfu/g and 2.0–5.5 log cfu/g, respectively. None of the flours complied with food safety standards for molds (maximum = 4 log cfu/g) while 88.0% of Obushera did (standard = maximum 1.3 log cfu/g). Total aflatoxin levels in sorghum, millet and Obushera were 22.3 ± 21.2 ppb, 9.9 ± 10.0 ppb and 10.4 ± 6.1 ppb, respectively. LAB bound 19.3–69.4% of AFB1 in a 1000 ppb solution with binding efficiency in the order of Lb. rhamnosus yoba 2012 = Lb. plantarum MNC 21 > W. confusa MNC 20 = L. lactis MNC 24. The LAB-AFB1complex remained stable under a series of washes with physiological saline. This study indicates that LAB with aflatoxin binding properties can be exploited for controlled cereal fermentations to improve food safety. Aflatoxins are toxic, carcinogenic and immunosuppressive metabolites of various strains of Aspergillus (A. ), mainly A. flavus, A. parasiticus, A. nomius and A. tamarii (Udovicki et al. 2018a; Iyanda et al. 2014; Black et al. 2013). The major aflatoxins are B1 (AFB1) - the most lethal, B2 (AFB2), G1 (AFG1) and G2 (AFG2) (Romani 2004). Aflatoxin contamination outbreaks cause fatalities. An outbreak in India caused 106 fatalities in 1974 (Reddy and Raghavender 2007). Another in Kenya led to 317 cases and 125 deaths in 2014 (Probst et al. 2007). In Tanzania, it led to 68 cases and 20 deaths in 2016 (Kamala et al. 2018). The outbreaks were linked to consumption of aflatoxin contaminated maize. Cereal-based fermented beverages such as beers and non-alcoholic lactic acid bacteria (LAB) fermented beverages are popular around the world. Although the non-alcoholic fermented beverages are more common in rural areas, particularly in low-income countries, commercialization has resulted in a renewed interest among urban populations. The beverages are popular for their social, religious, nutritional and therapeutic benefits (Aka et al. 2008). Cereal-based fermented beverages are mainly made from maize, sorghum, millet and barley (Aka et al. 2014; Osamwonyi and Wakil 2012). The cereals often contain aflatoxins which end up in the beverages (Ezekiel et al. 2018; Garrido et al. 2012; Warth et al. 2012). Indeed, aflatoxin contamination in traditional beverages is reported (Ezekiel et al. 2018; Odhav and Naicker 2002). There are also reports on aflatoxins in industrial fermented cereal-based beverages (Mably et al. 2005; Nakajima et al. 1999; Nigussie et al. 2018; Peters et al. 2017; Scott and Lawrence 1997). It is likely that there are high occurrences of aflatoxins in traditionally fermented cereal-based beverages since controls are not as strict as in industrial processes. Prevention of aflatoxin contamination, their detoxification or removal from food is crucial for consumer safety. However, complete removal from food is nearly impossible. Even cooking does not eliminate them so other methods are proposed (Kumar et al. 2017; El-Nezami et al. 1998). Physical methods entail cleaning, irradiation and adsorption while chemical methods use ozone and other chemicals (Jalili 2016). Unfortunately, many of these methods are costly, impractical, toxic, contradict FAO requirements, destroy nutrients and alter sensory properties (Verheecke et al. 2016; Huwig et al. 2001). So, biological methods where microbes degrade, bind or inhibit aflatoxins synthesis are better (Jalili 2016). Degradation is irreversible but binding may be reversible for some strains (Verheecke et al. 2016; Hernandez-Mendoza et al. 2009). Conflicting results of LAB-AFB1 binding exist (Shetty and Jespersen 2006; Taheur et al. 2017; Westby et al. 1997). Discrepancies relate to the strain specificity of this property, highlighting the need to examine different strains (Peltonen et al. 2001). Lactobacillus (Lb.) plantarum MNC 21, Lactococcus (L.) lactis MNC 24 and Weisella (W.) confusa MNC 20 are excellent starters for Obushera (Mukisa et al. 2012; Mukisa et al. 2017) but their AFB1 binding abilities were unknown. Considering that there is increasing global interest in probiotics, LAB with AFB1 binding and starter culture abilities would be vital in improving food processing, food safety and consumer health (Shetty and Jespersen 2006). Therefore, this study determined aflatoxin levels in sorghum and millet flours and Obushera sold in Kampala. Obushera is a name for popular traditional fermented or non-fermented sorghum and/or millet beverages from Uganda (Mukisa et al. 2012). Furthermore, the AFB1 binding abilities of the Obushera starters were evaluated. Lb. rhamnosus GG a known probiotic was the positive control (Kankaanpää et al. 2000). Flours of sorghum (n = 20) and millet (n = 20) were purchased from common wholesale points in Kampala where majority of the processors obtain their raw materials for Obushera processing. The most commonly sold type of Obushera known as Obutoko (n = 59) was purchased from different processors in Kampala. Obutoko is majorly made from sorghum but millet may be added as a source of indigenous starter cultures. Samples were transported in cool boxes containing ice blocks to the laboratory for analysis. Lb. 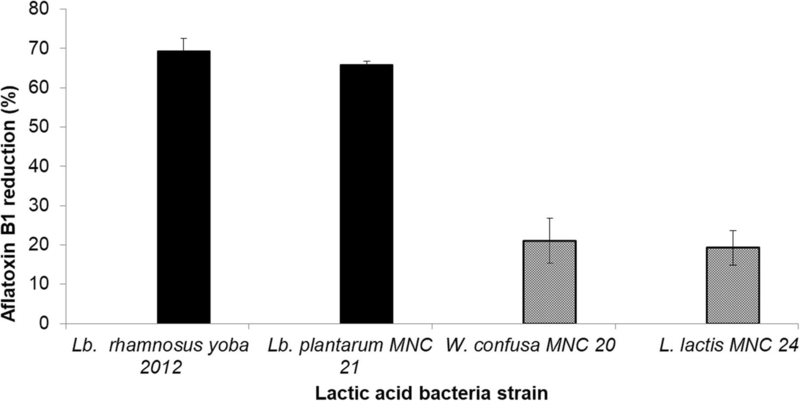 plantarum MNC 21, L. lactis MNC 24 and W. confusa MNC 20 strains previously isolated from Obushera were used (Mukisa et al. 2012). Lb. rhamnosus yoba 2012 (originally named Lb. rhamnosus GG) was obtained from Yoba for Life Foundation Amsterdam, The Netherlands. The strains were separately pre cultured in MRS broth (Laboratorios CONDA, Madrid, Spain) at 30 °C for 24 h. Lb. rhamnosus yoba 2012 was pre-cultured in MRS broth with tween 80 at 37 °C in an atmosphere containing 5% CO2 for 24 h. After incubation, cell pellets were centrifuged at 3200 x g, for 10 min at 25 °C. The pellets were then washed twice using physiological saline and subsequently serially diluted to obtain a cell concentration corresponding to 7 log cfu/ml. Mold counts were determined by surface spreading selected serial dilutions on pre-poured Potato Dextrose Agar (PDA) (Laboratorios CONDA, Madrid, Spain) containing 1% lactic acid. The plates were incubated at 25 °C for 7 days. For identification, mold colonies were picked from high dilution plates and sub-cultured on pre poured acidified PDA plates to obtain pure colonies. Mold identification was based on visual and microscopic examination according to Jay (1992). The morphological characteristics of the molds were also examined using a microscope (020–518.500 DM/LS I/98, Leica, Germany). Total aflatoxin content was determined using the RIDASCREEN® total aflatoxin enzyme immunoassay (R-Biopharm AG, Darmstadt, Germany). Briefly, 2 g of flour or 2 mL of Obushera (pH = 6), neutralized with 1 M NaOH were separately added into screw cap glass vials. Ten milliliters of methanol/distilled water (70/30; v/v) were mixed with the flour or beverage for 10 min at 25 °C. The extract was filtered (pore size: 11 μm, Whatman No. 1, Whatman GE Healthcare) and 100 μL of filtrate diluted with 600 μl of distilled water. Then 50 μl of standard solution or prepared sample were pipetted into duplicate wells followed by 50 μl of peroxidase conjugated aflatoxin B1 and 50 μL of antibody solution. The preparations were manually mixed, and incubated in the dark at 25 °C for 30 min. The wells were emptied and rinsed thrice with washing buffer. A hundred microliters of substrate/chromogen were added to the wells, mixed and incubated in the dark at 25 °C for 15 min. A hundred microliters of stop solution were then added to the wells, mixed and absorbance read at 450 nm within 30 min of adding stop solution. The ability of the lactic acid bacteria to bind AFB1 was determined according to the method described by Wacoo et al. (2019). Data for AFB1 binding efficiency was analyzed using analysis of variance to test for significance differences at an α value of 5%. The Tukey’s HSD test was used to separate the means. Analyses were performed by XLSTAT software (version 2010.5.02, Addinsoft, France). Data on mold incidence was analyzed using descriptive statistics and results presented as frequencies and means with standard deviations. Table 1 summarizes the concentration of molds in Obushera and cereal flours and their conformance to food safety standards. Figure 1 shows the incidence of molds in the flours and Obushera. 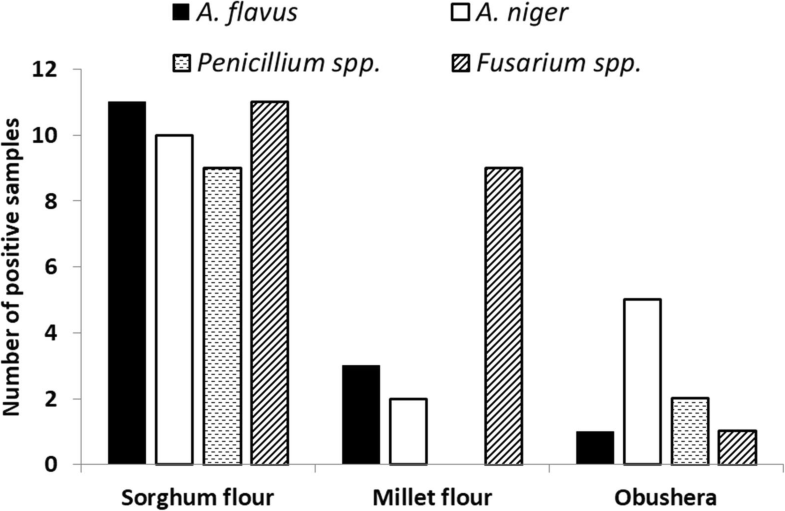 Sorghum flours were the most contaminated with more than half of the samples testing positive for A. flavus, A. niger, Penicillium spp and Fusarium spp. The same types of molds were found in Obushera, although their incidence was generally less than in the flours. The most prominent mold in the beverage was A. niger. Majority (88.0%) of Obushera samples complied with the standards for mold levels while all the cereal flours did not comply with the respective specifications. Limited data exist on the diversity and levels of fungal contamination in fermented cereal beverages, sorghum and millet flours. None-the-less our results agree with the available data. Similar to other studies, A. flavus, A. niger, Penicillium spp., and Fusarium spp. were reported as the common fungal contaminants in sorghum and millet flours (Hussaini et al. 2009; Osamwonyi and Wakil 2012; Weledesemayat et al. 2016). The levels of mold contamination in this study are also in agreement with other authors (N'Guessan et al. 2014; Alborch et al. 2012; Plavšić et al. 2017; Ntuli et al. 2013). Cereal grains such as maize, sorghum and millet, which are common raw materials for traditional fermented beverages, are quite susceptible to molds contamination (Ezekiel et al. 2018). Mold contamination in cereals is linked to pre and postharvest contamination of grains. Insect damage, drought stress, inadequate drying and poor storage practices facilitate mold proliferation in grains and subsequently in the flours (Hell et al. 2000). Moldy grain may be milled and used to make flours for food and fermented or non-fermented beverages. Furthermore, residual flour in the mills may contaminate subsequent batches (Berghofer et al. 2003; Ntuli et al. 2013). This study therefore, further illustrates that cereal flours are sources of aflatoxin contamination in fermented and unfermented beverages. The presence of molds in Obushera and related fermented cereal products has been reported before. Kateu (1998) observed contamination of Obushera with Aspergillus spp., Penicillium spp., Mucor spp. and Rhizopus spp. The total mold counts observed in this study were in the range (2–8 log cfu/g) reported by Kateu (1998). In a similar study, Mashak et al. (2014) also reported 3.5 log cfu/g of molds in Kashk-e Zard, an Iranian wheat-based fermented beverage. However, their study did not mention the mold genera. In contrast, Odhav and Naicker (2002) did not find molds in traditionally brewed South African beers: Imfulamfula, Umqombothi and Isiqatha. The presence of various mold types in food is a safety concern, however, the occurrence of A. flavus in raw materials and Obushera is particularly alarming given its aflatoxigenic potential. Therefore, the use of aflatoxin free or minimally contaminated raw materials is important for production of safe cereal-based beverages. Table 2 summarizes the total aflatoxin levels in the sorghum flours, millets flours and Obushera. The table also shows the proportions of Obushera and cereal flours that complied with the food safety standards for total aflatoxins. Mean total aflatoxin concentrations ranged from 9.9 ppb in millet flour to 22.3 ppb in sorghum flour. About 50–75% of the samples of flours and Obushera conformed to the specifications for aflatoxin contamination. Generally, more samples of Obushera than cereal flours conformed to the specifications for total aflatoxins. Similar findings have been reported with respect to aflatoxin contamination in cereal flours and cereal-based beverages. Kihara (2015) reported < 1–80.5 ppb of total aflatoxins in sorghum flours and 1.0–248.8 ppb in millet flours sampled from Nairobi, Kenya. Furthermore, up to 1000 ppb and 2110 ppb aflatoxins have been reported in laboratory pulverized sorghum and millet grains, respectively (Odoemelam and Osu 2009; Sirma et al. 2016; Weledesemayat et al. 2016). Bationo et al. (2015) detected up to 255 ppb aflatoxins in sorghum malt from Ouagadougou, Burkina Faso. In contrast, Makun et al. (2014) reported no aflatoxin contamination in millet grains from Nigeria. Despite A. flavus infection, Odhav and Naicker (2002) detected no aflatoxins in sorghum grain from South Africa. It is important to note that the conditions favorable for fungal growth in grains are not always conducive for mycotoxin production (Mannaa and Kim 2017). Mycotoxin production is dependent on the microbial strain, substrate type, temperature and water activity (aw) and climatic seasons (Abdel-Hadi et al. 2012; Klich 2007; Mousa et al. 2013; Obonyo and Salano 2018; Udovicki et al. 2018b). For instance, Abdel-Hadi et al. (2012) reported that optimal growth of A. flavus occurs at 30–35 °C and 0.99 aw, whereas the optimum conditions for aflatoxin production are 25–30 °C at 0.99 aw and 30–35 °C at 0.95 aw. Other fermented cereal beverages have also been reported to contain aflatoxins. Odhav and Naicker (2002) reported aflatoxin contamination in traditionally brewed South African beers: Isiqatha (12 ppb) and Utshwala special (200 and 400 ppb). Matumba et al. (2014) also found about 90 ppb of aflatoxin in traditional maize-based opaque beers from Malawi. Furthermore, traditional sorghum beers from Malawi contained up to 22 ppb aflatoxin (Matumba et al. 2011). Okaru et al. (2017) reported aflatoxin contamination (3.5–6.8 ppb) in opaque sorghum and millet beers in Kenya. Surprisingly, Bationo et al. (2015) did not find AFB1 in sorghum beers which were made from AFB1 contaminated malt in Ouagadougou, Burkina Faso. Additionally, aflatoxins were also not detected in traditional sorghum beers in Botswana (Nkwe et al. 2005). The contamination level of aflatoxins in fermented beverages is dependent on the initial concentration in the raw flours and the type of microbes involved in the fermentation. As shown in Table 2, the aflatoxin levels in Obushera were significantly lower than in the raw materials. Bationo et al. (2015), Ezekiel et al. (2015) and Nkwe et al. (2005) reported similar findings. Mycotoxin levels in fermented foods tend to be lower than in their raw materials because fermentation reduces their levels (Ezekiel et al. 2015; Karlovsky et al. 2016; Lee and Ryu 2017; Okeke et al. 2015). For instance, Matumba et al. (2011) observed that aflatoxin levels in thobwa, a cereal-based fermented beverage from Malawi, drastically reduced during fermentation. In another study, mycotoxin reductions of 76% in kunu-zaki and 59% in pito, both Nigerian cereal-based beverages were observed after fermentation (Ezekiel et al. 2015). Indeed, there are more studies that support the role of fermentation in reducing aflatoxin levels in fermented cereal-based beverages (Bationo et al. 2015; Chelule et al. 2010). Therefore, in the present study, fermentation could possibly explain the lower levels of total aflatoxins in Obushera in comparison to the flours (Table 2). The aflatoxin reduction could be attributed to the ability of certain LAB strains to bind, degrade or inhibit aflatoxin biosynthesis in food matrices (Mokoena et al. 2005; Nyamete et al. 2016). Table 2 shows that some of the Obushera contained aflatoxins despite the evidence of fermentation. Although fermentation is reported to lower aflatoxin levels (Mokoena et al. 2005; Nyamete et al. 2016), the process is not always effective. In fact, some authors also reported the presence of aflatoxins in fermented products (Matumba et al. 2011; Matumba et al. 2014; Odhav and Naicker 2002). This could be attributed to the spontaneous nature of the fermentations. There is no guarantee that the wild cultures in the gruels can reduce aflatoxin levels. This therefore, necessitates identifying and using starter cultures with proven ability to effectively lower aflatoxin concentrations. Such cultures should be purified, propagated and commercialized for production of safe traditional fermented cereal-based beverages. Otherwise, habitual consumers of these products are potentially highly exposed to aflatoxins. This study was mainly focused on evaluating the aflatoxin concentration in cereal flours and Obushera. However, the presence of Aspergillus, Fusarium and Penicillium species in the flours and Obushera is an indication that other mycotoxins such as ochratoxin A and trichothecenes (Udovicki et al. 2018a, 2018b) could be potential contaminants in this product and related beverages. The percentage binding of AFB1 by the Obushera LAB starters in physiological saline is summarized in Fig. 2. The extents of binding by Lb. rhamnosus yoba 2012 and Lb. plantarum MNC 21 were similar (p > 0.05) but higher (p < 0.05) than that of W. confusa MNC 20 and L. lactis MNC 24. Both W. confusa MNC 20 and L. lactis MNC 24 had similar binding capacities (p > 0.05). Three aqueous washes using physiological saline did not release the bound aflatoxin. The use of LAB in binding of aflatoxins is considered a viable and safe strategy for lowering absorption and facilitating elimination of the toxins from the body (Hamidi et al. 2013). According to Peltonen et al. (2001), some LAB strains can bind aflatoxins to their cell walls or cell wall components thus lowering the bioavailability of the toxins. Similar to other studies (Haskard et al. 2001; Peltonen et al. 2001), our work demonstrated the ability of LAB strains to bind AFB1 in spiked culture media. However, the results contradict findings of Taheur et al. (2017) who did not observe AFB1 binding by Lb. kefir KFLM3. This was possibly because aflatoxin binding is strain-dependent. In fact, there were notable differences in the AFB1 binding capabilities of our LAB strains (Fig. 2). Peltonen et al. (2001) noted the same for dairy strains of LAB and Bifidobacteria. These differences are possibly due to variations in the cell walls and cell-envelop structures of different strains. In spite of the differences, the three strains showed incredible ability (19–66%) to bind 1000 ppb of AFB1 (Fig. 2). Of the three strains, L. plantarum MNC 21 showed the highest (p < 0.05) binding ability. In fact, like the reference strain, it bound about three times more AFB1 than L. lactis MNC 24 and W. confusa MNC 20 (Fig. 2). Currently, literature states 400 ppb as the highest aflatoxin level reported in a fermented cereal-based beverage (Odhav and Naicker 2002). Therefore, the ability of our LAB to bind close to 66% of 1000 ppb AFB1 (660 ppb) suggests their potential application in cereal fermentations with the aim of reducing the aflatoxin threat. The usefulness of LAB in binding aflatoxins is subject to whether the binding is reversible or not or how stable the complex is to conditions of the gastrointestinal tract. Several researchers have reported reversible binding of AFB1 by LAB. Repeated aqueous washes released 62 and 50% AFB1 bound by Lb. rhamnosus LC-705 and Lb. rhamnosus GG, respectively (Peltonen et al. 2001); Haskard et al. 2001). Reversible binding could be due to weak non covalent interactions between the toxin and the microorganism (Taheur et al. 2017; Peltonen et al. 2001). Fortunately, unbinding appears to be strain dependent and even when it occurs, not all the toxin is unbound. For instance, Haskard et al. (2001) observed 38 and 50% AFB1 retention by Lb. rhamnosus LC-705 and Lb. rhamnosus GG, respectively following several washes. It is also important to note that there are studies that have reported excellent stability of the AFB1-LAB complex especially for heat and acid treated cells. Utami et al. (2017) noted only 0.3 and 0.4% release of AFB1 by acid treated Lb. acidophilus LC 1 and Lb. acidophilus ATCC 4356, respectively after five washes using phosphate buffer saline. Although our study suggested stable in vitro binding, the findings cannot at this point guarantee the stability of the AFB1-LAB complexes under gastrointestinal conditions. We can only speculate, at the moment that the complexes formed between our LAB and AFB1 are stable under gastrointestinal conditions and may aid the excretion of AFB1 from the body as has been reported for different LAB strains (El-Nezami et al. 2000; Gratz et al. 2004; Gratz et al. 2006; Huang et al. 2017; Kankaanpää et al. 2000; Liew et al. 2018). The presence of aflatoxins in cereals and traditional fermented cereal beverages such as Obushera is of public health concern considering the adverse effects of these toxins. Therefore, an integrated approach should be considered to mitigate aflatoxin contamination in raw materials and in the subsequent products. Different actors in the value chains of cereals such as sorghum and millet that are used for producing fermented traditional products should be sensitized on appropriate practices for preventing aflatoxin contamination in grain. Processors of traditional fermented products should also ensure that they use cereal grains or flours that meet specifications for aflatoxin content. Furthermore, processors should also consider using starter cultures such as Lb. plantarum MNC 21, L. lactis MNC 24 and W. confusa MNC 20 to bind residual aflatoxins. Future studies should evaluate the potential of spontaneous fermentations, Obushera lactic starters and Lb. rhamnosus yoba 2012 in reducing aflatoxin contamination in spiked samples. Additionally, the stability of the LAB-AFB1 complex should be evaluated under gastro intestinal conditions. The authors thank Mr. Brighton Kansiime-Mukama and Mr. Daniel Muwanguzi for their assistance in sample collection. The authors are also grateful to the Obushera processors for their cooperation in the study. All datasets from which conclusions of the manuscript have been drawn are presented in the paper. SB collected data and wrote the manuscript, APW contributed to data collection particularly aflatoxin analyses, IMM planned the research, SB, APW, RM, IMM, YBB and CM reviewed the manuscript and approved it. EAC, East African Community. (2011). Sorghum flour - specification (DEAS 95: 2016). https://members.wto.org/crnattachments/2016/TBT/UGA/16_3723_00_e.pdf. Accessed 2 Jan 2018. EAC East African Community (2016) Millet flour - specification (EAS 89: 2011). https://law.resource.org/pub/eac/ibr/eas.89.2011.pdf. Accessed 2 Jan 2018. EU European Union (2006) Commission regulation (EC) no 1881/2006 of 19 December 2006. Setting maximum levels for certain contaminants in foodstuffs. https://eur-lex.europa.eu/legal-content/EN/TXT/PDF/?uri=CELEX:02006R1881-20170728&rid=1. Accessed 19 Sept 2018. UNBS Uganda National Bureau of Standards (2009) Fermented (non-alcoholic) cereal beverages - specification (DUS 872:2009). https://members.wto.org/crnattachments/2018/SPS/UGA/18_5341_00_e.pdf. Accessed 23 July 2017.